Soy milk, especially when it's hot with just a hint of sugar, is my comfort drink. The stuff you buy from cartons is marginal and they are usually flavored and thickened. Any decent Chinese market sells fresh, and sometimes hot, soy milk from a plastic jugs, but it is still not ideal because of that plastic jug (landfill!) and because it isn't organic. I've thought about buying a soy milk maker before, but it's such a specific machine and it would take up a lot of precious space. What if I could use what I already have, specifically my super duper Vitmix blender? Pickiness, not necessity, is the mother of invention in my world. A little research showed that this has been done (and there's one baffling website where someone makes soy milk while wearing a bikini), and after a few tweaks, I made fresh, hot soy milk that tastes just like the stuff I love at Chinese breakfast restaurants. The best part is that if you have dried soy beans handy, you can make it in less than 10 minutes from start to finish. Even better, there isn't a pot of soybeans you have to watch and stir, you don't have to remember to soak your beans overnight, and there is no straining. Start by boiling two cups of water. 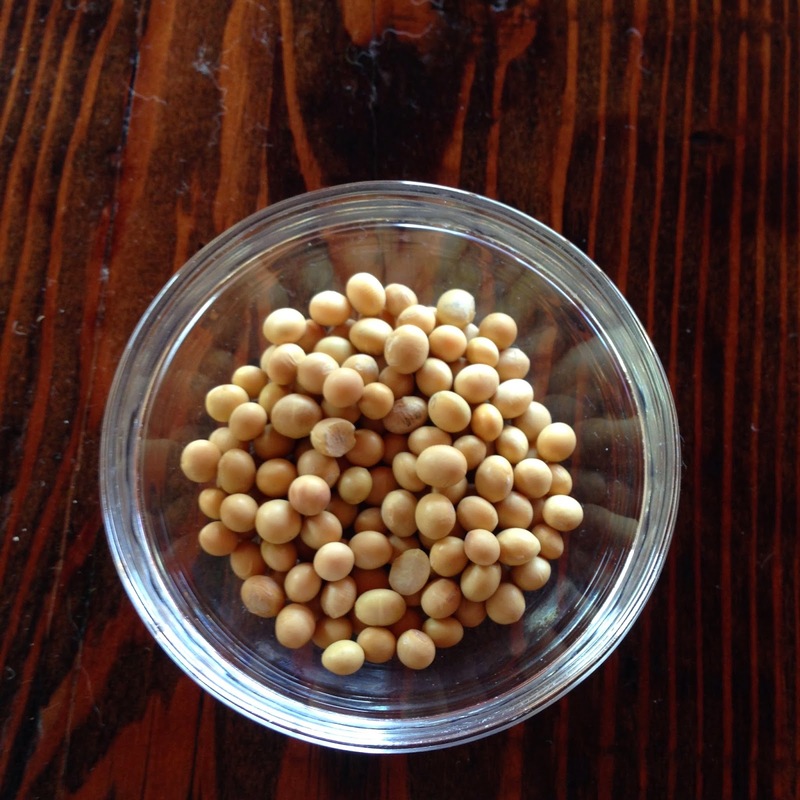 While the water is boiling, measure out 1-ounce of dried soybeans. Combine the boiling water and the soybeans into a Vitamix and mix on HIGH for 6 minutes (start the blender at 1, ramp it up to 10, and then flip the HIGH button). If you want to sweeten the soy milk, add your sweetener and blend for another 10 seconds. I added 2 tablespoons of dark brown sugar to my soy milk, but I've also added maple syrup or just plain cane sugar. I've also added a pinch of salt, which is also very good. Although the temptation will be to make more than 2 cups at a time, don't do it! The soy milk foams up as it blends, and there is plenty of clearance to prevent it from foaming over and out of your blender when you only do 2 cups at a time. Also, starting with boiling water is key since you want to cook the soybeans - I tried with hot water from the sink, and the resulting milk was disgusting because it still tasted like raw beans. If you don't have a Vitamix, any blender on steroids will do, like a Blendtech. I love when I can figure out a way to make something I usually buy, and it is way easier than I anticipated. I've made soy milk the old fashioned way (soak beans, blend beans with water, strain, and cook the milk), and it was a mess and not worth the effort. However, I can boil water and weigh beans just fine, thankyouverymuch. Going to try this with regular and black soy beans! Thanks! The results were amazing. Trying this for the first time, the soymilk has a creamy and thick feel to it. Drinking it right after straining, the temperature was still warm giving me the "warm fuzzies"! :) The taste, well, it's plain as should be expected without any sweetener. This can be cured with honey. The smell, holy mary. The sweet aroma just filled the kitchen enveloping my mind. I would be missing out on half of the experience if I were to soley drink this soymilk without making it. Another great experience is hand-grinding coffee... YA!